Halloween is a spooky long-standing tradition brought to America from Scottish and Irish immigrants in the 19th century. Today, however, Halloween celebrations and decorations have been taken to a whole new level as fun-loving people across the nation go all out to ensure they have the wackiest and spookiest house on the block. In addition to dressing up ourselves, children, and pets to revel in the ghoulish festivities, we also go the extra mile to decorate our homes inside and out as well. It’s the special time of year where everyone wants their home to be the most haunted house around. That being said, Halloween is also for people of all income brackets, and there are plenty of affordable spooky decorations ready to invoke frights and chills day and night. However, in order to win the title of “Scariest Home on the Block” a little effort is needed when picking out Halloween décor. From witches and zombies to ghosts, goblins, and coffins, there are dozens of different types of fun and creepy Halloween decorations just waiting to spook every guest and passerby. To shorten your workload and provide you with more time for thrills and chills, here are ten spooktastic Halloween decorations that are sure to bring goosebumps and smiles this Hallow’s Eve! 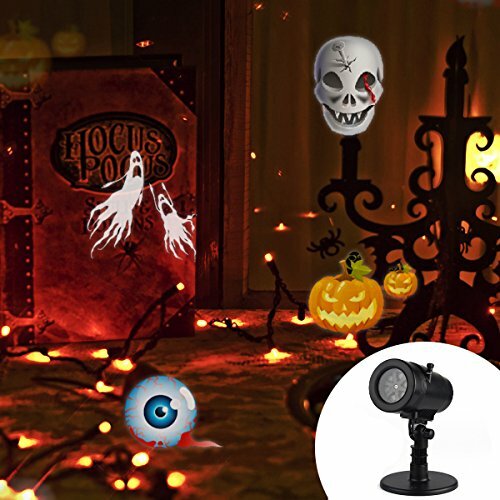 The CM-Light Halloween LED Rotating Outdoor Projector Lights make a wonderful addition to outdoor Halloween décor. The high-quality projector lights cover approximately 300 square feet and feature a new and improved LED bulb for increased wattage and brightness. While additional slides for Christmas, birthdays, St. Patrick’s Day, and other celebrations are included, the Halloween series truly stands out. With a large skeleton, ghost, pumpkin lantern, and bloody eyeballs, it’s by far one of the best Halloween projectors available. The projector features a durable ABS housing to withstand the elements and years of use, speed control function, built-in automatic timer, and a ground stake for easy installation. It’s also lightweight, portable, and waterproof. Meanwhile, the projected images are big, clear, and remarkably colorful, making them a great complement to the rest of your Halloween décor. Simply set it up to project on the front of your home and you’re guaranteed to have one of the most fun and spooky homes on the block. To top it all off, the life-size witch also has sound-activated glowing red eyes, for added spookiness after the sun sets. However, she is a bit cartoonish, which makes it perfect for the kiddos. She’s also designed to hand not stand, which takes away from her realistic look. 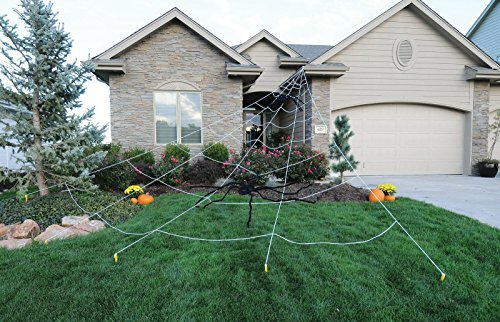 The Mega Spider Web Outdoor Halloween Decoration measures a huge 23 feet by 18 feet. This makes it capable of holding the largest of creepy crawlers and scaring arachnophobes of all ages. The web is easy to put up and includes five ground stakes and one gutter bracket. Simply spread out the stakes in your yard and attach the gutter bracket to have a large spider web outside the front of your home in no time at all. Although a spider decoration isn’t included, the triangle-shaped Mega Spider Web Outdoor Halloween Decoration is made of a tough and durable polyester blend, allowing it to hold the biggest of spider decorations and endure all types of weather. The white webbing isn’t glow in the dark, but it’s reflective enough to get noticed day and night. Plus, a spotlight can be used for an added effect. Best of all, it’s lightweight and can be easily wrapped up and stored year after year. If you’re in need of a huge spider web to round out your Halloween decorations, this giant web is a great option. Nothing says “Halloween is here” more than a jack-o-lantern, and the 36-Inch Light Up Pumpkin Decoration beats a standard jack-o-lantern in several ways. Not only does it stand 36 inches tall, but it lights up with the flick of a switch and won’t burn your house down if left unattended. 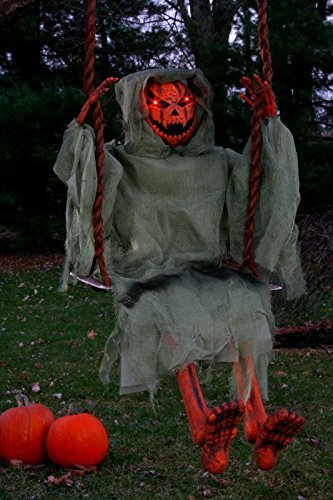 Unlike regular old light up pumpkins designed to sit on steps, a ledge, or the ground, it also sits on a swing for added effect. It comes with two hooks, which can be attached to any tree branch for quick and easy installation. It’s also fun and not overly spooky, making it a wonderful decoration for little ones to enjoy. Perfect for decorating the front yard and showcasing your Halloween spirit, this oversized orange and green light up pumpkin is one of the best pumpkin or jack-o-lantern decorations on the market today. Looking for something a little spookier and capable of sending chills down the spines of trick or treaters? The Severed Hanging Torso Halloween Haunted House Décor certainly fits the bill. 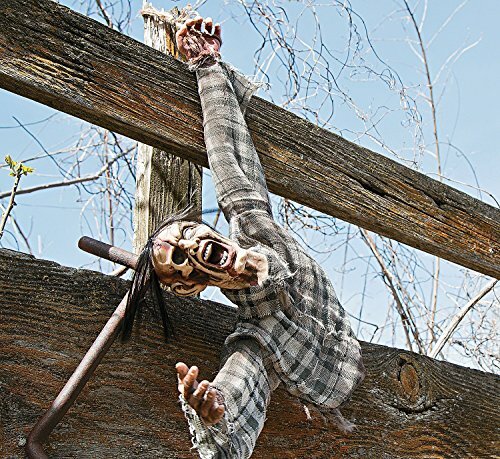 Designed to provide frights during the day or night, the realistic Severed Hanging Torso is the perfect addition to Halloween zombie decorations, outdoor graveyards, and haunted houses. It even has an exposed rib cage for added realism and chills. On the downside, it would be nice if it stood on its own rather than hanging. Nonetheless, it’s extremely authentic looking and makes a great Halloween door decoration for any and all Halloween lovers. It’s also made of quality plastic and made to provide several years of scares. 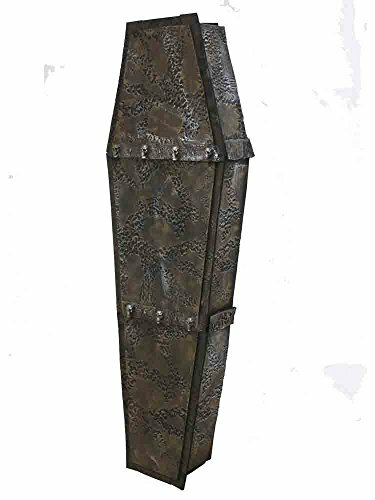 There’s arguably nothing creepier than a coffin, so this Realistic Halloween Coffin Prop is right at home in your front yard during the Halloween season. Standing 59.25 inches tall or long (depending on how you choose to display it), 19 inches wide, and seven inches deep, it’s nearly full size and able to hold almost any skeleton prop. However, the realistic look of the coffin is scary enough to send chills down the spines of trick or treaters all by itself. Despite being made of foam and cardboard, which makes it incredibly light and portable, it looks eerily similar to the real thing. With a brown and silver metallic finish and black pitted marks, it has an undeniable gothic feel. Tiny skulls also run across both bands, increasing the scary factor even more. Some assembly is required, but thanks to its pre-installed Velcro, no tools are needed and putting it together is easy as 1-2-3. The only downfall is the fact that it’s not waterproof. It also shouldn’t be placed near burning candles or any other heat source. Overall, however, it’s a great Halloween prop that’s sure to scare the Dickens out of everyone who walks by. Perhaps the only thing scarier than a gothic coffin on Halloween is this 72-Inch Cocoon Corpse Decoration. The life-size corpse stands six feet tall and is designed to hang upside down by an included wire and hook on a front porch, tree in the front yard, or anywhere else for that matter. 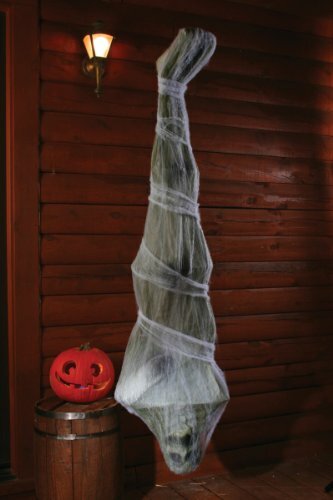 The upside down corpse is completely enclosed by a thick mass of spider webs, allowing it stand out from other Halloween decorations and make an awesome addition to any Halloween display. When a light is shined on it, the eyes and facial features of the corpse really stand out, adding to its creepy effect. For the price, it’s an excellent buy. 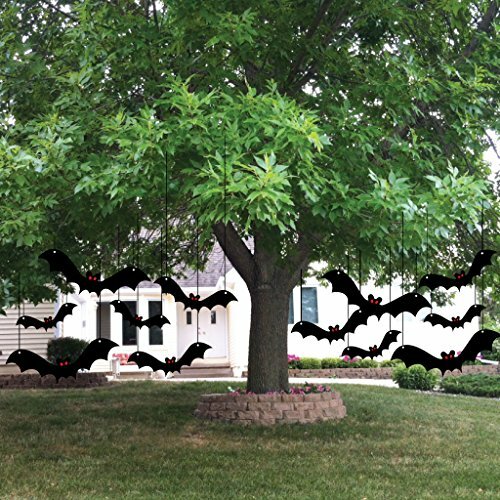 When it comes to Halloween decorations, hanging bats are nothing new. However, these Scary Hanging Bats are some of the most realistic and creepy bats being made today. 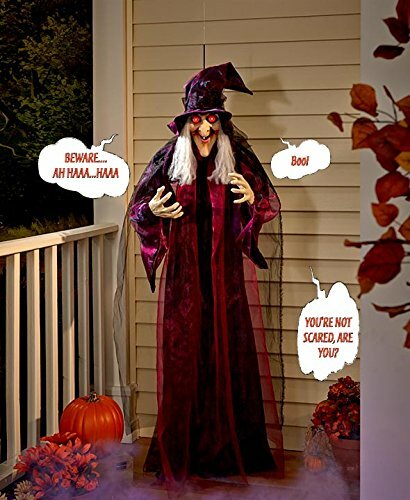 These Halloween yard decorations come in a variety of sizes and feature a black corrugated plastic construction. When the wind blows, these Scary Hanging Bats move around in an eerily lifelike manner, making them even scarier. Vinyl eye stickers are also included, but they don’t glow in the dark, which would be nice for shining at night. Another potential downfall is the fact that hanging wire isn’t included. However, by simply attaching clear fishing line through the eye holes, you’ll be able to hang them from any tree without noticing the line at all and adding to their realistic look. Halloween decorations don’t always have to make your heart race and send chills down your spine. 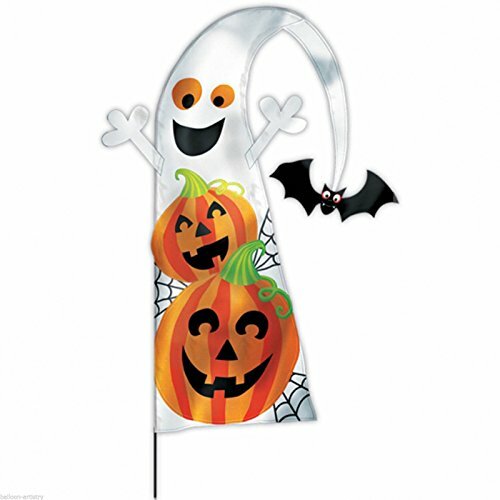 Made for kids and everyone to enjoy, the Family-Friendly Halloween Trick or Treat Feather Yard Flag is a happy welcoming ghost with a pumpkin and smiling bat friend for a truly Happy Halloween. The weatherproof fabric flag stands 4-3/4 inches tall and comes with a stake for easy installation. You can place it by the front door or anywhere else in your yard to enjoy all October long. It’s the perfect complement to any Halloween décor. 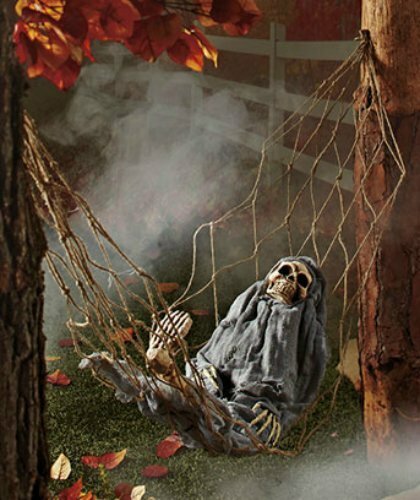 The Interactive Skeleton in Hammock is a fun Halloween decoration perfect for adding a little spookiness to the corner of any yard or porch. The hammock is eight feet long, and the attached skeleton figure is just shy of three feet. While it’s not full size, the one-legged skeleton is sound activated for bone-chilling fun. Whenever someone makes a noise, it comes to life. Its chest moves to simulate breathing and it yawns and snores, adding to its haunting effect.